“The world offers itself to your imagination,” wrote poet Mary Oliver. On good days, we can journey through the poem. It’s a big danged poem, but after awhile it kind of starts to make sense. Wandering the hills of southern Indiana, where I live, I marvel at the wind and trees. A microburst of wind heedlessly plucks a regal oak from the middle of a grove and throws it down in a thrash of wasted foliage. Hiking through hardwood forests after a storm, I stare at trees cracked off in conflicting directions. This confusion of arboreal casualties can perplex, even frighten. How such strength can be so reduced to devastated confusion–it’s beyond my small understanding. But within hours, workers will come through with their chainsaws and cranes and bucket trucks to clear roads and restore electrical power. We are tillers in fields vast beyond the reach of eye or even intellect. By its very nature, the wind is the most eternal force we can actually touch. It can tell us more of the Ultimate than we really want to know. Great belts of atmosphere surround us, eternal shapers of life. The part of North America I know, is swept by what sailors call the “prevailing westerlies.” At this latitude, an endless band of wind carries dust from the loess plains of China, chases waves across the Pacific, deposits that dust against the west coast of the United States. It picks up rain from the Alaska Current, casts down oak trees in Indiana, blows New York smog over the Atlantic. On and on. It brings rain to Ireland and volcanic dust from Iceland to northern Europe. Then around again. It has been blowing this way for millions of years: sweeping, carrying, settling. On a pleasant day it seems so nurturing, so pleasant–so eternal. It teases my hair and makes the leaves do a canopy-wide happy dance. I love the breeze–and the trees. They never complain, nor do they plot or have ambition. Yet no temple I have ever seen or read about, can match them in their spreading, cathedral byways. Trees sprout and blossom and wither and fall, same as we do. 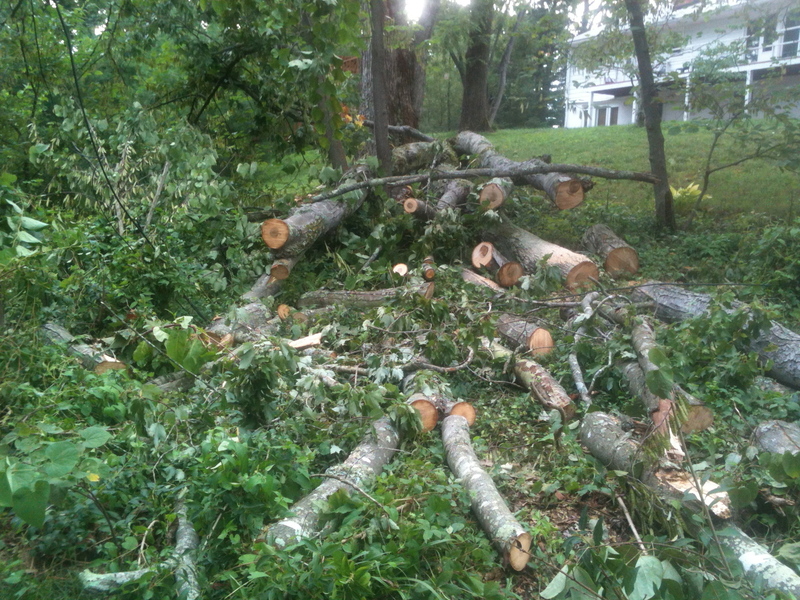 So–after the storm–I walk through the surviving forest, returned to peace except for the scattered, shattered hardwood who weren’t lucky this time. And I and wonder. We can learn a lot from trees if we have the time and humility. And the wind. Our prevailing westerlies. They blow Chinese dust and Pacific moisture to the western slopes of our continent. Southern California receives relatively little of that moisture, but Washington’s Olympic Mountains get it, literally, by the ton. Their so-called “temperate rain forests” receive, on average, more than twelve feet of rain a year. The lavish precipitation turns Olympic National Park into a thirty-story moss patch. Towering Sitka spruce, western redcedar, Douglas-fir: these trees dwarf my midwestern hardwoods. Supercharged by endless moisture, their green, pyramidal ranks climb the mountainsides, festooned by club mosses that hang like immense feather-boas. Style statements by trees. You have to see it to believe it. Along the road to the park’s Hoh Rainforest Ranger Station, tourists used to stop and marvel at one of the largest Sitka spruces in the world. Hundreds of years old, it loomed so far over your head you couldn’t even make out the crown. It was the kind of tree you could only look at and say, “Dang, that’s one big tree.” It was all the mind could do to connect its hugeness with its tree-ness, let alone find more adequate words to express the wonder. That was only till December, 2014, though. A winter storm’s wind snapped the tree off 35 feet up, leaving a looming stump called a “snag,” and tree-shards the size of houses. The tree didn’t just fall. It shattered like a vase plummeting off a table. Thirty stories high and twenty feet across, it had faced down hundreds of years of Pacific coast storms. Was this one storm just that much more fierce than the others? No. Studying the huge remnants one soon perceives, something more than wind was going on. Except for the outermost few inches, beneath the bark, the whole tree was consumed by dry rot. This tourist attraction had been dying from the inside out for decades. Even as people like you and me gawked and marveled at its stature, this “monarch of the forest” had been, you might say, a dead tree walking. There’s a happy ending, though. Such fallen monarchs become nests of spicery for all manner of rainforest flora and fauna. Birds and squirrels make homes in the snags. Seeds land on such fallen trunks, sprout, and grow in the richness of the rot. You can’t walk a hundred yards in this rainforest without coming upon a dozen such logs, many with rows of new trees growing out of them. The deadfalls eventually rot completely away, leaving the new trees’ roots to stand in graceful arches. Gothic architecture designed by a tree. That, too, has to be seen to be believed. This fallen monarch never set out to be a monarch in the first place. That was our word: it only set out to be a tree. Soon, it will be more alive than it was during its final years of jaw-dropping magnificence. Biologists have even given such deadfalls a charming name: “nurse logs.” There are, it seems to me, less noble fates–for a tree or even for a person, metaphorically speaking–than to become a nurse log. At age 65, I’m definitely learning from trees. Thanks so much for the friend request that brought us together this week. This post is so appropriate for me personally – we lost the mother white oak that centered our 43 acres for almost 300 years. Our neighbor who cuts firewood is here today again with all his equipment, cutting, splitting and stacking. Like the Hoh Forest tree, it was only a shell at the base; high winds snapped it off at ground level. My wife has breast cancer metastatic to bone; the scans are terrifying. But like the tree, she is determined to stand until she falls, and with great medical support, complementary therapies and loads of loving help, we’ve been making that happen for 2 years this week. I am the administrator for our small lay led fellowship’s Facebook page. I gear our posts to external outreach, and to serve members and friends who are not regular attenders for a variety of reasons, many logistical in this sparsely populated area. I look for pieces that will meet the needs of those barely familiar with UUism as well as those longing for more UU in their lives. A few facts: Very few of our regular attenders use Facebook – the reasons are varied. In general, we have a huge broadband gap in our area, and for many people, access to the internet is on their phones with limited gigs. So this is something of a solo experimental mission on my part. We have had one visitor who found us on Facebook. A single mother, she has not been back but is staying in touch via Facebook. I would like to have your permission to share some of your posts on our Facebook page. I assume you mean for the to be shared, but want to be sure this use is okay, since I do not actually know you.